Maximm - Quality construction the extension cord is UL listed and adheres to industry standards for safety and quality assurance for an added peace of mind. 13amp 125volt, 1625 Watts. They are versatile due to its rotating plug providing angular flexibility to a full 360 degrees, the prongs rotate in the plug so you can aim the cord in any direction you wish without blocking the other outlets. Since it hugs the wall nicely and extends only a half an inch from the wall bending to a 90-degree angle - so it doesn't poke into adjacent objects - you can place your desk, couch, bookshelf etc, right up against the wall freeing up some space. Power rating: 1625 watts 13 amps at 125 volts 360° rotating plug: the maximm extension cord is top quality featuring a 360° degree rotating flat supply plug with 3 female outlet connectors for additional power. Multiple outlets: the female receptacle comes with 3 outlets giving you the option to plug in multiple devices or appliances thus having the same extension to three devices at once. Space savor: convert your standard ac power cord to a slim rotating plug, providing angular flexibility. It has a space-saving design to eliminate bulky or awkward cords. White - UL Listed - Maximm Cable 10 Ft 360° Rotating Flat Plug Extension Cord/Wire, 16 AWG Multi 3 Outlet Extension Wire, 3 Prong Grounded Wire - The outlets are arranged with 2 plugs spaced conveniently on one side with the other plug on the opposite side. Maximm 360° rotating flat plug Extension Cord/Wire The rotating extension cords are unique for their sleek and adaptable design. Multiple usesthe three outlet extension cord just makes it easy and convenient by providing you with up to 3 additional outlets for power distribution, letting you add another appliance or device right there without pulling out an extra cord and getting the same extension. Maximm - Plug into the top outlet and still have usage of the bottom outlet with this rotating cord. Flat plug: designed for tight spaces like behind furniture, bookshelves, desks or anything which is close to the wall not allowing you to use the standard outlet. High quality: 3-pronged outlets, grounded plug for safety and convenience, nemA 5-15P to Multiple 3-Outlet NEMA 5-15R 3 Conductor Wire UL Listed Extension Cord. Clutter controlmaximm solves those power problems with ease using the Flat Plug Rotating Extension Cord. Maximm 360° rotating flat plug Extension Cord/Wire The rotating extension cords are unique for their sleek and adaptable design. Multiple usesthe three outlet extension cord just makes it easy and convenient by providing you with up to 3 additional outlets for power distribution, letting you add another appliance or device right there without pulling out an extra cord and getting the same extension. UL Listed - Maximm Cable 8 Ft 360° Rotating Flat Plug Extension Cord/Wire, 16 AWG Multi 3 Outlet Extension Wire, 3 Prong Grounded Wire - White - . It has a space-saving design to eliminate bulky or awkward cords. Quality construction the extension cord is UL listed and adheres to industry standards for safety and quality assurance for an added peace of mind. Since it hugs the wall nicely and extends only a half an inch from the wall bending to a 90-degree angle - so it doesn't poke into adjacent objects - you can place your desk, couch, bookshelf etc, right up against the wall freeing up some space. Power rating: 1625 watts 13 amps at 125 volts 360° rotating plug: the maximm extension cord is top quality featuring a 360° degree rotating flat supply plug with 3 female outlet connectors for additional power. Multiple outlets: the female receptacle comes with 3 outlets giving you the option to plug in multiple devices or appliances thus having the same extension to three devices at once. Maximm - Since it hugs the wall nicely and extends only a half an inch from the wall bending to a 90-degree angle - so it doesn't poke into adjacent objects - you can place your desk, bookshelf etc, couch, right up against the wall freeing up some space. It has a space-saving design to eliminate bulky or awkward cords. UL Listed - Maximm Cable 6 Ft 360° Rotating Flat Plug Extension Cord/Wire, 16 AWG Multi 3 Outlet Extension Wire, 3 Prong Grounded Wire - White - Space saver: convert your standard ac power cord to a slim rotating plug, providing angular flexibility. 13amp 125volt, 1625 Watts. 360° rotating plug: the maximm extension cord is top quality featuring a 360° degree rotating flat supply plug with 3 female outlet connectors for additional power. Multiple outlets: the female receptacle comes with 3 outlets giving you the option to plug in multiple devices or appliances thus having the same extension to three devices at once. Space savor: convert your standard ac power cord to a slim rotating plug, providing angular flexibility. Multiple usesthe three outlet extension cord just makes it easy and convenient by providing you with up to 3 additional outlets for power distribution, letting you add another appliance or device right there without pulling out an extra cord and getting the same extension. The outlets are arranged with 2 plugs spaced conveniently on one side with the other plug on the opposite side. Maximm - Maximm 360° rotating flat plug Extension Cord/Wire The rotating extension cords are unique for their sleek and adaptable design. Multiple usesthe three outlet extension cord just makes it easy and convenient by providing you with up to 3 additional outlets for power distribution, letting you add another appliance or device right there without pulling out an extra cord and getting the same extension. Quality construction the extension cord is UL listed and adheres to industry standards for safety and quality assurance for an added peace of mind. Specifications cord length: 3 feet - length does not include two ends connector 1: 1 NEMA 5-15 male grounded AC plug Connector 2: 3 NEMA 5-15 female grounded AC sockets Wire gauge: 16AWG Max. Plug into the top outlet and still have usage of the bottom outlet with this rotating cord. Flat plug: designed for tight spaces like behind furniture, bookshelves, desks or anything which is close to the wall not allowing you to use the standard outlet. High quality: 3-pronged outlets, grounded plug for safety and convenience, nemA 5-15P to Multiple 3-Outlet NEMA 5-15R 3 Conductor Wire UL Listed Extension Cord. White - UL Listed - Maximm Cable 3 Ft 360° Rotating Flat Plug Extension Cord/Wire, 16 AWG Multi 3 Outlet Extension Wire, 3 Prong Grounded Wire - 13amp 125volt, 1625 Watts. 360° rotating plug: the maximm extension cord is top quality featuring a 360° degree rotating flat supply plug with 3 female outlet connectors for additional power. Multiple outlets: the female receptacle comes with 3 outlets giving you the option to plug in multiple devices or appliances thus having the same extension to three devices at once. Space savor: convert your standard ac power cord to a slim rotating plug, providing angular flexibility. Maximm - Plug into the top outlet and still have usage of the bottom outlet with this rotating cord. Flat plug: designed for tight spaces like behind furniture, bookshelves, desks or anything which is close to the wall not allowing you to use the standard outlet. High quality: 3-pronged outlets, nema 5-15p to multiple 3-outlet nema 5-15r 3 Conductor Wire UL Listed Extension Cord. 13amp 125volt, 1625 Watts. 360° rotating plug: the maximm extension cord is top quality featuring a 360° degree rotating flat supply plug with 3 female outlet connectors for additional power. Multiple outlets: the female receptacle comes with 3 outlets giving you the option to plug in multiple devices or appliances thus having the same extension to three devices at once. Maximm Cable 1 Ft 360° Rotating Flat Plug Extension Cord/Wire, 16 AWG 12 Inch Multi 3 Outlet Extension Wire, 3 Prong Grounded Wire - UL Listed - White - Space savor: convert your standard ac power cord to a slim rotating plug, providing angular flexibility. Plug into the top outlet and still have usage of the bottom outlet with this rotating cord. Flat plug: designed for tight spaces like behind furniture, bookshelves, desks or anything which is close to the wall not allowing you to use the standard outlet. High quality: 3-pronged outlets, nema 5-15p to multiple 3-outlet nema 5-15r 3 Conductor Wire UL Listed Extension Cord. 13amp 125volt, 1625 Watts. 360° rotating plug: the maximm extension cord is top quality featuring a 360° degree rotating flat supply plug with 3 female outlet connectors for additional power. Multiple outlets: the female receptacle comes with 3 outlets giving you the option to plug in multiple devices or appliances thus having the same extension to three devices at once. Maximm - Clutter controlmaximm solves those power problems with ease using the Flat Plug Rotating Extension Cord. Plug into the top outlet and still have usage of the bottom outlet with this rotating cord. Flat plug: designed for tight spaces like behind furniture, bookshelves, desks or anything which is close to the wall not allowing you to use the standard outlet. High quality: 3-pronged outlets, grounded plug for safety and convenience, nemA 5-15P to Multiple 3-Outlet NEMA 5-15R 3 Conductor Wire UL Listed Extension Cord. Plug into the top outlet and still have usage of the bottom outlet with this rotating cord. Flat plug: designed for tight spaces like behind furniture, bookshelves, desks or anything which is close to the wall not allowing you to use the standard outlet. UL Listed - Maximm Cable 2 Ft 360° Rotating Flat Plug Extension Cord/Wire, 16 AWG 24 Inch Multi 3 Outlet Extension Wire, 3 Prong Grounded Wire - White - High quality: 3-pronged outlets, nema 5-15p to multiple 3-outlet nema 5-15r 3 Conductor Wire UL Listed Extension Cord. It has a space-saving design to eliminate bulky or awkward cords. Plug into the top outlet and still have usage of the bottom outlet with this rotating cord. Flat plug: designed for tight spaces like behind furniture, bookshelves, desks or anything which is close to the wall not allowing you to use the standard outlet. High quality: 3-pronged outlets, nema 5-15p to multiple 3-outlet nema 5-15r 3 Conductor Wire UL Listed Extension Cord. Quality construction the extension cord is UL listed and adheres to industry standards for safety and quality assurance for an added peace of mind. Maximm - 13amp 125volt, 1625 Watts. 360° rotating plug: the maximm extension cord is top quality featuring a 360° degree rotating flat supply plug with 3 female outlet connectors for additional power. Multiple outlets: the female receptacle comes with 3 outlets giving you the option to plug in multiple devices or appliances thus having the same extension to three devices at once. Space savor: convert your standard ac power cord to a slim rotating plug, providing angular flexibility. Plug into the top outlet and still have usage of the bottom outlet with this rotating cord. Flat plug: designed for tight spaces like behind furniture, bookshelves, desks or anything which is close to the wall not allowing you to use the standard outlet. High quality: 3-pronged outlets, grounded plug for safety and convenience, nemA 5-15P to Multiple 3-Outlet NEMA 5-15R 3 Conductor Wire UL Listed Extension Cord. 13amp 125volt, 1625 Watts. Plug into the top outlet and still have usage of the bottom outlet with this rotating cord. Flat plug: designed for tight spaces like behind furniture, bookshelves, desks or anything which is close to the wall not allowing you to use the standard outlet. Black - Maximm Cable 10 Ft 360° Rotating Flat Plug Extension Cord/Wire, 16 AWG Multi 3 Outlet Extension Wire, 3 Prong Grounded Wire - UL Listed - High quality: 3-pronged outlets, nema 5-15p to multiple 3-outlet nema 5-15r 3 Conductor Wire UL Listed Extension Cord. Plug into the top outlet and still have usage of the bottom outlet with this rotating cord. Flat plug: designed for tight spaces like behind furniture, bookshelves, desks or anything which is close to the wall not allowing you to use the standard outlet. Maximm Maximm Cable - Plug into the top outlet and still have usage of the bottom outlet with this rotating cord. Flat plug: designed for tight spaces like behind furniture, bookshelves, desks or anything which is close to the wall not allowing you to use the standard outlet. High quality: 3-pronged outlets, grounded plug for safety and convenience, nemA 5-15P to Multiple 3-Outlet NEMA 5-15R 3 Conductor Wire UL Listed Extension Cord. It has a space-saving design to eliminate bulky or awkward cords. Power rating: 1625 watts 13. 5 amps at 120 volts 360° rotating plug: the maximm extension cord is top quality featuring a 360° degree rotating flat supply plug with 3 female outlet connectors for additional power. Multiple outlets: the female receptacle comes with 3 outlets giving you the option to plug in multiple devices or appliances thus having the same extension to three devices at once. 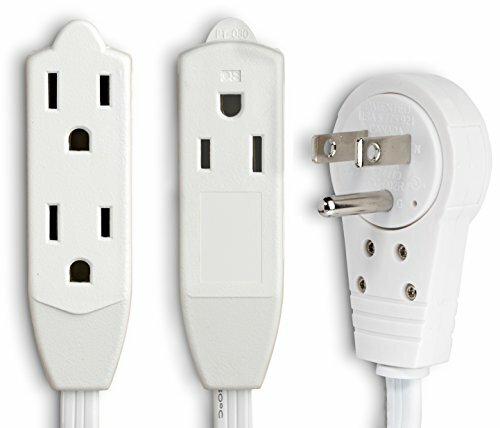 White - UL Listed - Maximm Cable 20 Ft 360° Rotating Flat Plug Extension Cord/Wire, 16 AWG Multi 3 Outlet Extension Wire, 3 Prong Grounded Wire - Space saver: convert your standard ac power cord to a slim rotating plug, providing angular flexibility. 13amp 125volt, 1625 Watts. 360° rotating plug: the maximm extension cord is top quality featuring a 360° degree rotating flat supply plug with 3 female outlet connectors for additional power. Multiple outlets: the female receptacle comes with 3 outlets giving you the option to plug in multiple devices or appliances thus having the same extension to three devices at once. Space savor: convert your standard ac power cord to a slim rotating plug, providing angular flexibility. Plug into the top outlet and still have usage of the bottom outlet with this rotating cord. Maximm - 13amp 125volt, grounded plug for safety and convenience, 1625 Watts. 360° rotating plug: the maximm extension cord is top quality featuring a 360° degree rotating flat supply plug with 3 female outlet connectors for additional power. Multiple outlets: the female receptacle comes with 3 outlets giving you the option to plug in multiple devices or appliances thus having the same extension to three devices at once. Maximm Cable 10 Feet 360° Rotating Flat Plug Extension Cord/Wire, 3 Prong Grounded Wire 16 Awg Power Cord - White - High quality: 3-pronged outlets, grounded plug for safety and convenience, nemA 5-15P to Multiple 3-Outlet NEMA 5-15R 3 Conductor Wire UL Listed Extension Cord. Plug into the top outlet and still have usage of the bottom outlet with this rotating cord. Flat plug: designed for tight spaces like behind furniture, bookshelves, desks or anything which is close to the wall not allowing you to use the standard outlet. High quality: 3-pronged outlets, nema 5-15p to multiple 3-outlet nema 5-15r 3 Conductor Wire UL Listed Extension Cord. 13amp 125volt, grounded plug for safety and convenience, 1625 Watts. 360° rotating plug: the maximm extension cord is top quality featuring a 360° degree rotating flat supply plug with 3 female outlet connectors for additional power. Plug into the top outlet and still have usage of the bottom outlet with this rotating cord. Flat plug: designed for tight spaces like behind furniture, bookshelves, desks or anything which is close to the wall not allowing you to use the standard outlet. High quality: 3-pronged outlets, nema 5-15p to multiple 3-outlet nema 5-15r 3 Conductor Wire UL Listed Extension Cord. Maximm Cable 15 Ft 360° Rotating Flat Plug Extension Cord/Wire, 16 AWG Multi 3 Outlet Extension Wire, 3 Prong Grounded Wire - Black - UL Listed - 13amp 125volt, 1625 Watts. 360° rotating plug: the maximm extension cord is top quality featuring a 360° degree rotating flat supply plug with 3 female outlet connectors for additional power. Multiple outlets: the female receptacle comes with 3 outlets giving you the option to plug in multiple devices or appliances thus having the same extension to three devices at once. Wiremold CMK10 - Plug into the top outlet and still have usage of the bottom outlet with this rotating cord. Flat plug: designed for tight spaces like behind furniture, bookshelves, desks or anything which is close to the wall not allowing you to use the standard outlet. High quality: 3-pronged outlets, grounded plug for safety and convenience, nemA 5-15P to Multiple 3-Outlet NEMA 5-15R 3 Conductor Wire UL Listed Extension Cord. 13amp 125volt, grounded plug for safety and convenience, 1625 Watts. 360° rotating plug: the maximm extension cord is top quality featuring a 360° degree rotating flat supply plug with 3 female outlet connectors for additional power. Multiple outlets: the female receptacle comes with 3 outlets giving you the option to plug in multiple devices or appliances thus having the same extension to three devices at once. Wiremold Cord Hider CordMate Kit | Paintable On-Wall Cable Raceway Kit, Hide & Organize One Wire | TV Cable Concealer - Space savor: convert your standard ac power cord to a slim rotating plug, providing angular flexibility. Perfect for family rooms or bedrooms. Plug into the top outlet and still have usage of the bottom outlet with this rotating cord. Flat plug: designed for tight spaces like behind furniture, bookshelves, desks or anything which is close to the wall not allowing you to use the standard outlet. High quality: 3-pronged outlets, grounded plug for safety and convenience, nemA 5-15P to Multiple 3-Outlet NEMA 5-15R 3 Conductor Wire UL Listed Extension Cord. 13amp 125volt, 1625 Watts.